Gross Domestic Product (GDP) is simply the market value of all officially recognized final goods and services produced. 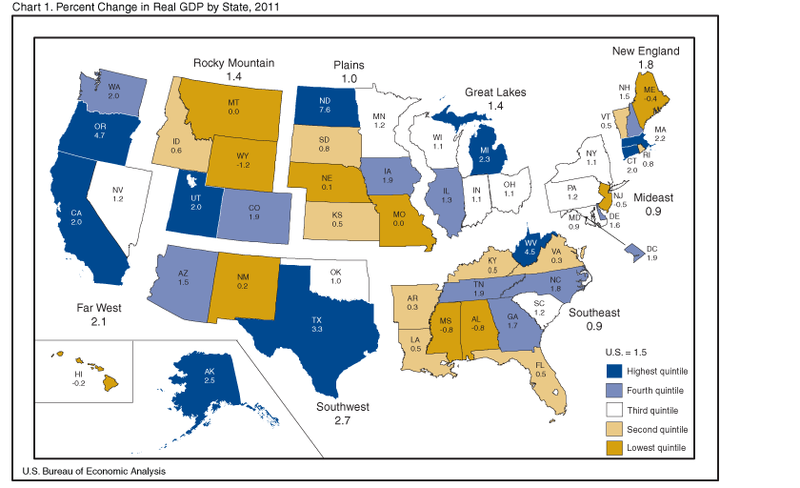 The US government not only calculates GDP for each of its states but also GDP growth. GDP growth is an excellent indicator of how well a state's economy is doing. The Bureau of Economic Analysis at the US Department of Commerce puts out this chart each year. Look at the states in the higher quintiles. States like Texas, Oregon and Massachusetts have much higher GDP growths than Mississippi or Alabama (whose growths actually were negative). As an international student planning to go to the US, would you go to a school in a state whose economy is doing well rather than not? The answer is obvious. We recommend that you limit your schools to states within the top two or three quintiles of GDP growth rates. Going to schools in the other states is just not worth it. Some exceptions apply, so please see Exceptions in Step 3.